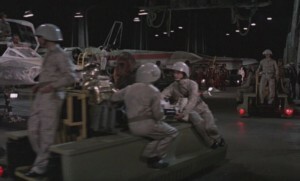 Yavin Hangar Technicians played an important role in the battle against the evil Empire. The technicians ensured that the fighters and their droids were in full working order allowing the rebel pilots to destroy the first Death Star. 1. Helmet: Accurate tech helmet (RFT helmet with no swoop on back) Helmet can be white or light gray and can have either a white/light gray or black com box. 2. Flightsuit: Light tan or light gray coverall with mandarin-style collar and pointed tab, rectangular pocket with a flap closure on upper right arm, 2 hip pockets and 4 leg pockets. No visible zippers or snaps. This is the same flightsuit as the Pilots wear and pockets should be the same. Pants can be hemmed or cuffed. 3. Belt: dark khaki, khaki green, British Khaki, Olive, Olive drab or dark tan with a roll pin buckle. Belt should have mini-flare loops that can be empty or contain the mini-flares. 4. Boots/shoes: Black boots or black shoes with rounded toe and smooth finish. 1. Antenna on comm box on helmet. 2. Mini flares may be worn in belt loops. A mix of empty and filled slots is allowed. Revised on January 3, 2015.